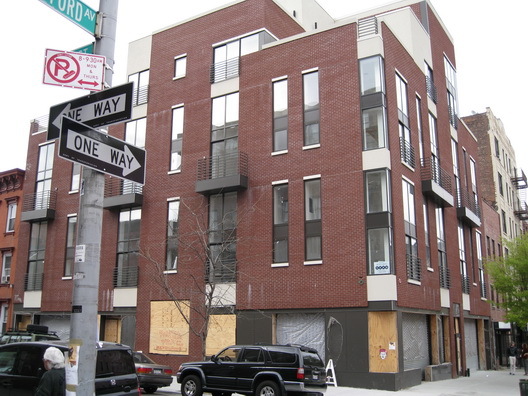 This condo development at Bedford Avenue and S. 2nd Street (official address for city purposes: 320 Bedford Avenue) has been underway so long that we began to think that it was in perpetual construction. It lost its fence...but, wait, it also gained a Stop Work Order a couple of weeks ago along with one of those 1o-day intent to revoke permit letters (that often amount to nothing more than another delay). So, we're not out of the woods yet. It is a fairly restrained piece of Scaranotecture, featuring more red brick and fewer design flourishes than are typical of work from Robert Scarano. This building is not to be confused with a nearby Scarano that goes by the unfortunate name of The Pad.